I just finished my Christmas card for this year! Whoo Ha! And yes, I do realize that it's December 15th, and I haven't even ordered the darn cards yet, much less written my holiday letter, but can I just tell you, I don't care. I'm not in a bad mood or anything like that. I just don't feel like getting all worked up about it. It will get done when it gets done and it's not going to matter to anyone else when it gets done. So why stress? I don't stress about the baking, or the decorating, or the gifts. Really, in my world, the only stress for the holidays is getting the packages that have to be shipped out bought and shipped out. Everything else can happen when it happens. And I love this attitude. It helps me to just enjoy the season. And I am. And I hope you are enjoying yours as well. That card is absolutely precious. And good for you for not getting stressed over it all. We could all take that advice and enjoy the season more. I've actually been better this year than in years past. Baby steps ya know! Love it! Loving the peppermints! Thanks to you, I think I have a new addiction. DigiScrapping! 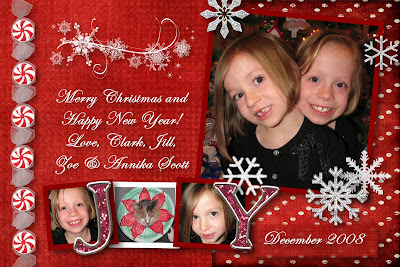 I have NOT done Christmas Cards this year and I am sooo not going to stress out about it! Great post! Merry Christmas and thanks for stopping over at my blog! Me too:-) Life is too short. Cute card! You've got lots of time to mail them out. We may not have cards this year...but I'm not stressing either. You have given me an itch to bake some goodies the last couple days. It's good to be able to do something because you want to and not because you have to. Haha! My post tomorrow mentions this exact thing! I just ordered my cards tonight. Oh well, they will get out when they get out. I made your toffee this weekend, but mine was crumbly - not sure where I went wrong. Oh, well. It was my first time using a candy thermometer so it could have been worse! I love your Christmas cards. That is my goal for next year, to learn how to do that. Thank you for the treat bucket. Oh my heavens, was it grand. You couldn't try everything fast enough...a little of this, a little of that, more of this, more of that...hide it from the kids. :) You are once again...amazing!